Travel the world safely with travel insurance! Travel insurance varies depending on the traveler and the insurer, but there are two basic types of coverage. Medical insurance covers the emergency expenses that you may incur while you are away on your trip. If you cannot travel due to unforeseen medical circumstances, medical insurance covers the non-refundable trip costs. If you become sick during your trip and have to return home before your scheduled date, medical insurance covers the bulk of the cost. Flight insurance coverage provides a wide range of assistance for issues that occur before or during travel and at the airport. For example, if your plane is delayed and you miss a connecting flight as a result, flight insurance provides you with a nominal reimbursement. The health insurance (or other insurance) you have at home or through your employer might provide international protection, but the chances are that it’s limited. Check with your provider to see what coverage you have before your trip. Keep in mind that only travel insurance provides trip cancellation and trip interruption coverage. If you discover that your current health insurance does not offer protection overseas, you can receive the care you need through medical travel insurance. Still on the fence about securing travel insurance for your next adventure with AESU? 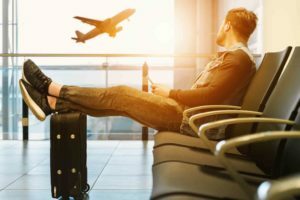 With travel insurance, globetrotters can protect their financial investment as well as many of their pricey personal items. Travel insurance ensures that you are protected during the entire duration of your trip, which means you will have help in the event that you fall ill or suffer an injury. The best aspect of travel insurance is that you can enjoy a new city, country, and culture with the peace of mind knowing that your health and possessions are covered. *Disclaimer: The above information is general information regarding travel insurance and may not be applicable to your specific coverage. Please refer to your individual policy for unique coverage information and restrictions. This entry was posted on Wednesday, January 23rd, 2019	at 9:53 am	. You can follow any responses to this entry through the RSS 2.0	feed. You can leave a response, or trackback from your own site.